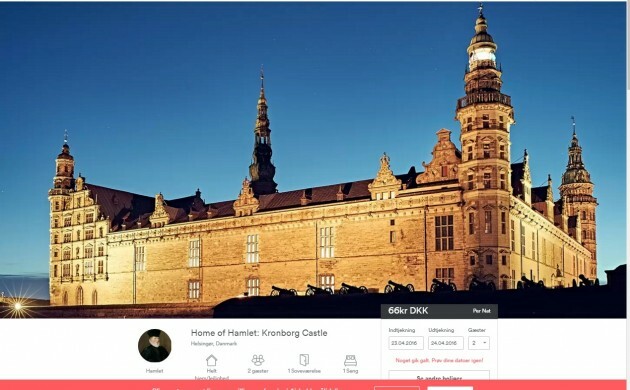 “To slumber or not to slumber?” was the query many Shakespeare fans and travel connoisseurs faced this month when Hamlet’s castle, Kronborg Slot (Elsinore in the play), was listed on Airbnb for a single night of accommodation on April 23, the 400th anniversary of Shakespeare’s death. Following a competition involving hundreds of applicants, the winner turned out to be Melanie Rio, an American author and graduate student pursuing an MA in Shakespearean studies at King’s College London. “A few people sent me links to the contest, and when I saw in the description that submissions in iambic pentameter were encouraged, I couldn’t resist. That may have been a joke, but I decided to go for it because I’m a writer and writing silly things in iambic pentameter is an odd hobby I’ve picked up in the past few years. Shakespeare has always been my definitive creative influence and inspiration, so it seemed like a good way to pay homage,” Rio said. “Hamlet is an intensely atmospheric play, and I’m eager to be immersed in the world of ‘Elsinore’ as we know it and as Shakespeare’s contemporaries may have known it. The language is so captivating and evocative, you can all too easily imagine yourself in ‘the very witching time of night’ that Hamlet describes. It’s not every day you get to explore the place that inspired words like that. Rio’s application (read in here in English) opened the door for her and a companion to be the first people in over 100 years to spend one historic night in a secret room in the King’s Tower. Interestingly, the competition’s runner-up was Rufus Gifford, who aside from being the US ambassador to Denmark is also an avid Shakespeare fanatic. He will join Rio for a celebratory banquet including a host of Danish artists, writers and actors portraying Hamlet’s friends and foes. “Our winner really got inside Shakespeare’s universe and came up with absolutely the best reason for why she of all people should spend a night in the room,” said Erik Als, the manager of Kronborg. To mark the 400th year since William Shakespeare died, Kronborg Castle will be transformed into a mesmerising Hamlet universe this summer, celebrating the British playwright within its own majestic halls. About Town: Shakespeare unplugged and let loose!